Line from the film: "Joe, why are you eating a foot?" I was a big fan of director Kyle Rankin’s Infestation, a horror / comedy / apocalyptic film from 2009 in which mankind’s existence was threatened by an invasion of giant bugs. 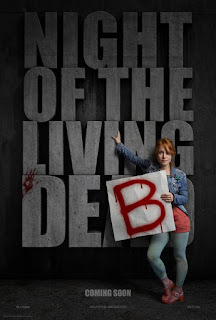 So when I saw that Mr. Rankin was also responsible for 2015’s Night of the Living Deb, my hopes were high. But while Infestation drew me in almost immediately with its humor and special effects, it took a while for me to warm up to the director’s latest offering, and its title character was the reason why. Take, for instance, the opening few scenes. While relaxing in a bar with her good friend Ruby (Julie Brister), Deb Clarington (Maria Thayer), who works for a local news station in Portland, Maine, spots a cute guy across the room and, cheered on by Ruby, gathers up the courage to talk to him. The guy is Ryan Waverly (Michael Cassidy), who’s in the midst of having a fight with his fiancée Stacy (Syd Wilder). Jump ahead to the next morning, when a confused Deb wakes up, all alone, in Ryan’s bed! Ryan is actually in the next room, chatting with his brother on the phone and trying to figure out a way to get Deb to leave as quickly as possible. Deb overhears this, but pretends she’s been asleep until Ryan finally walks in. With a big smile on her face, Deb talks of spending the day (which is July 4th, a holiday) with Ryan and his family, acting as if they’re already a couple. At first I thought she was having some fun at Ryan's expense, but the problem is she doesn’t let up, and a few minutes later what might have been funny is… well, kinda creepy. At this point, I had no idea what to make of this film’s quirky lead character. I wasn’t crazy about Deb at the outset, but I have to admit I warmed up to her as the movie progressed, and by the time the final credits rolled, I absolutely loved her. Shortly after parting ways, Deb and Ryan have a few frightening encounters on the streets of Portland, and before long realize that, at some point during the night, a quick-moving disease transformed most of the town’s citizens into bloodthirsty zombies. Luckily, the two are able to make their way back to Ryan’s apartment, where they formulate a plan to collect their loved ones and head for safety. Hopping into Deb’s car, they first stop to check in on Ruby (who has already “turned”), then rush over to pick up Ryan’s gun-loving brother Chaz (Chris Marquette) as well as his father (Ray Wise), a self-made millionaire who controls the entire town’s water supply. Ryan is also relieved to learn that Stacy spent the night with his family, and wants to make up with him. As it turns out, Ryan’s dad is the one responsible for the zombie outbreak (an experimental chemical was accidentally released into the town’s drinking water). Still, despite his role in this disaster, Ryan’s dad has enough pull with the Governor to order a helicopter that will lift them all to safety. But, unbeknownst to Ryan, dear old dad has no intention of bringing Deb along. Will Ryan risk his neck for a girl he barely knows, or will he save himself instead? One of the strengths of Night of the Living Deb is its cast. Marquette and Wise (both of whom also had major roles in Infestation) play Ryan’s corrupt dad and gun-crazy brother, and have their share of entertaining scenes (Marquette is especially hilarious as the imbecile you can’t help but like). In addition, Syd Wilder is both sultry and aggravating as Ryan’s overbearing fiance Stacy, taking what is basically a one-note character and breathing as much life into her as possible. But Night of the Living Deb is all about Deb and Ryan, and how a zombie outbreak brought them closer together. Both Thayer and Cassidy do a fine job as the mismatched couple (she is spontaneous and unpredictable but lacks self-confidence; he is an ecology nut who turned his back on his family’s fortune, yet doesn’t have the strength to stand up to his father or brother when the chips are down). Yes: there have been hundreds, if not thousands, of movies in which a man and a woman, from different sides of the tracks, fall desperately in love. But how many were set during a zombie apocalypse? 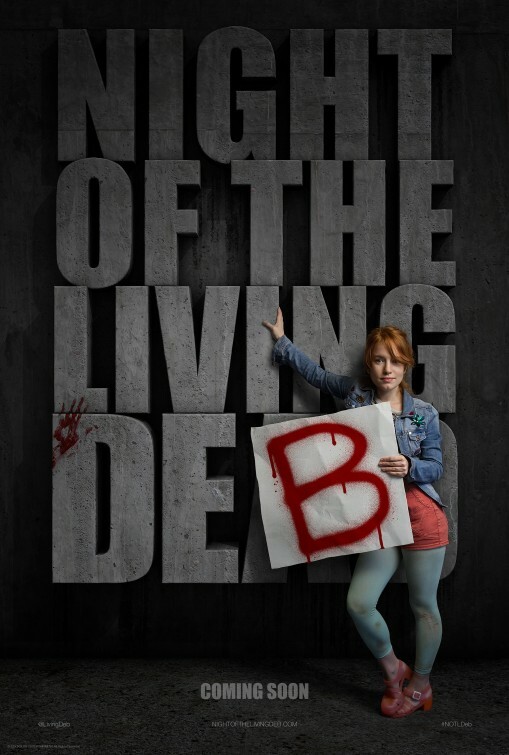 Ultimately, Night of the Living Deb doesn’t quite work as a horror movie; aside from a few close calls with the undead early on, there’s not much here to get your pulse pounding. As for the comedy, it’s slightly more effective, due mostly to the film’s witty dialogue (while looking through Ryan’s fridge for some snacks to take on their journey, Deb instead finds nothing but health food. “Coconut milk?” she says sarcastically, “Are we in Portland or on Gilligan’s Island?”). I also liked how the film played fast and loose with the accepted rules of a zombie apocalypse (from what started the outbreak to the manner in which its spread), which is sure to give zombie aficionados a few chuckles. But this is not the kind of movie that will consistently crack you up. What sets Night of the Living Deb apart from all the others is the love affair that develops between its two leads, and while that’s not exactly what genre fans want to hear, I think the film’s charms may just win them over in the end. At least that’s how it was with me.